Eliminations for WCG 2001 in Poland took place in internet cafes in 50 cities with 50 players qualifying for Warsaw finals. You probably won't believe it, but we've competed against computers and player that scored highest qualified in given city. Only one player qualified in each city, so in big cities where there were several good players, they agreed with each other to which cities they would go for qualifications. Three best players from the Warsaw finals went to Seoul for world finals. In these times I was able to win with the best, however on the day of WCG 2001 finals in Warsaw I performed poorly. I didn't get any sleep on the night before as I was traveling in the night and I've had stomach problems just before the games, so I couldn't really focus. After that event I haven't played much or seriously in StarCraft anymore, so that was all of my "progaming" experience. I've played with the best in Poland, so in the end I've had fun. The first Word Cyber Games was held in 2000, but in Poland the first WCG was in 2001. 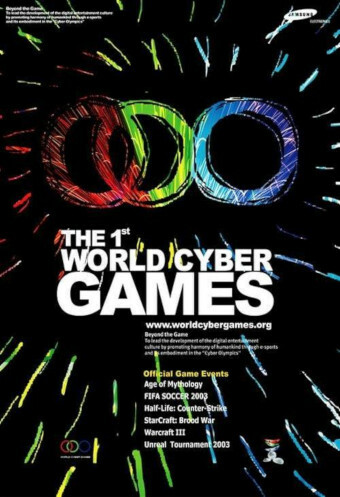 There were 33 countries participating in the second WCG 2001, but what is surprising they called it "the 1st World Cyber Games" as seen on the poster below. I guess they realized that it wasn't "world" when there were only 16 countries invited to WCG 2000. Yes, that's Blackman - middle row, second from the right. I've played zvz with him... and lost BlackMan wasn't top 3 that year.. he was real good, but I guess he was unlucky as well. If I recall correctly he went to Korea the next year or so. Cool, thanks for sharing your moments!